Sometimes the information needed to properly assign a component to an artifact is not part of its architecture filter name. Imagine for example a code generator that generates classes for different functional modules. If all those classes end up in the same package it becomes very hard to assign the generated classes to the right functional modules unless the class name contains some clue. If those generated classes could be properly assigned based on an annotation that would be a far more effective method of assignment. This post assumes that you are already familiar with Sonargraph’s architecture DSL. If not, I recommend first reading “how to organize your code”. Here Controller depends on Foundation. We also assume that classes from Foundation are used in the public interface of the controller classes. That means that each client of Controller must also be able to access Foundation. This is certainly not ideal because it requires the knowledge that everything that uses the Controller artifact must also connect to Foundation. It would be better if that could be automized, i.e. if anything connects to Controller it will automatically be connected to Foundation too. Using the new keyword transitively in the connect statement will add Foundation to the default interface of Controller. That means that anybody connecting to the default interface of Controller will also have access to Foundation without needing an explicit dependency. Before we had transitive connections an interface could only export nested artifacts. Now interfaces can also export connected interfaces. In the example above we add the default interface of Foundation to the Service interface of Controller. Exporting interfaces that are not a connection of he parent artifact will cause an error message. This feature is available with Sonargraph 9.6 or higher. Let me know what you think about it in the comment section below. Many companies already have some established architectural design patterns which are supposed to be used in most of their applications. For example it makes sense to standardize the layering of business components. It also makes sense to establish specific rules how one business component can access another one. In the upcoming 9.4 release of Sonargraph-Architect we implemented a new feature in our architecture DSL which should make it very easy to add generic architectural blueprints to a quality model which would allow automatic verification of those architectural design patterns on any business component without having to create a component specific architecture. Sonargraph’s architecture DSL is now about 18 months old and we received a lot of positive feedback from customers bundled with ideas for improving the language. There are now several projects with more than one million LOC that use this language to define and enforce their architectural blueprint. Of course this feedback is most valuable for us and we did our best to implement a good share of the ideas brought to us. This article requires some basic knowledge of our architecture DSL. An introduction can be found here. To use all the features described below you need Sonargraph-Architect version 9.3 or higher. There are some basic patterns that are used in almost every architectural model. Those patterns describe the relationships between sibling artifacts, i.e. artifacts that have the same parent. Layered architecture – here dependencies are allowed to flow top-down within an ordered list of sibling artifacts. If we use strict layering, an artifact can only access ist next sibling artifact. In the case of relaxed layering, artifacts have access to all artifacts defined beneath them. Independent – here sibling artifacts are independent from each other, i.e. there should be no dependencies between them. Unrestricted – here siblings artifacts have no restrictions in accessing each other. This is not very desirable because it will allow cyclic dependencies between artifacts, but can be really useful when working on a model for a legacy software system. 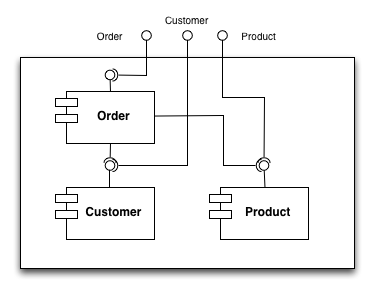 It is always a good idea to cut your system along functionality, and here we can easily see three subsystems. In Java you would map those subsystems to packages, in other languages you might organize your subsystem into separate folders on your file system and use namespaces if they are available. The problems start when it comes to describing your architecture in a formal and enforceable way. You could write a nice Wiki article to describe the architecture of your system, or describe it on a Powerpoint slide or with a set of UML diagrams; but that would be quite useless because it is not possible to check in an automated way whether or not your architecture is respected by the code. And everybody who ever worked on a non-trivial project with more than 2 developers knows that rules will be broken. That leads to an ever increasing accumulation of architectural debt with all kinds of undesirable side effects for the long term sustainability of a piece of software. You could also use Sonargraph 7 or similar tools to create a graphical representation of your architectural blueprint. That is already a lot better because you can actually enforce the rules in your automated builds or even directly in the IDE. But it also means that everybody who wants to understand the architecture will need the tool to see it. You also will not be able to modify the architecture without having access to the tool. Wouldn’t it be nice if you could describe your architecture as code, if you had a DSL (domain specific language) that can be used by software architects to describe the architecture of a system and that is expressive and readable enough so that every developer is able to understand it? Well, it took us a while to come up with that idea, but now I believe that this is the missing puzzle piece to significantly boost the adoption of formalized and enforceable software architecture rules. The long term benefits of using them are just to good to be ignored. It is quite interesting to see that many promoters of agile development approaches now consider an ongoing management of technical debt as critical for the development of high-quality and maintainable software. This challenges the idea that development decision should almost exclusively be driven by business value because it is quite hard to assess the value of paying back technical debt or investing time into a solid software architecture. It seems to me that the value of managing technical debt and a solid architectural foundation increases more than linear with project size. If your project is just a couple thousand lines of code and the team is just 2 or 3 people it is relatively easy to add architecture on demand by continuous refactoring. But as soon as we have tens of thousands of code lines, ongoing development of new features and larger teams things become a lot more complicated. In this case the management of technical debt and investments into a solid architectural foundation pay big dividends, as described thoroughly in this research paper. The problem is how to measure technical debt and focussing on the right kind of technical debt. I will first discuss measuring of technical debt and then delve into the different categories of technical debt and their impact on project outcomes.